Must LOOK like a Mandalorian helmet from the MODERN ERA. No modified Hasbro CLONE HELMETS or modified clone helmets not already approved. Only approved so far is the “Mando Commando” helmet. Rubies 1 piece BOBA FETT helmets will no longer be accepted for use by the club. Existing Official Members with Rubies Boba Fett 1 piece helmets are exempt however, it is HIGHLY recommended that you upgrade as soon as possible. Exception for Verd’ikas, judged on a per applicant basis. The reason for this exclusion is the helmet’s quality is poor and the price is high. There are many more cost effective, better quality options available. Hasbro Boba Fett helmet must reach minimum quality standards before it is accepted. Custom visor designs are allowed, however at least 1/3 of the total vertical T portion must be apparent. The Executioner helmet represents the bare minimum allowable area of visor exposure allowable. If changes are made to the Executioner helmet, they must not further obscure these elements. Helmet size will be judged on a case-by-case basis. Generally, the helmet’s width should not greatly fall short of or exceed 1/2 the width of the shoulders measured from shoulder to shoulder. Boba Fett helmet dent must be filled for any applicant who is not applying as Boba Fett. If a Boba/Jango Fett rangefinder earcap is attached to either side of the helmet, the full earcap must be worn. A rangefinder is not required, but the cover cap must be in place. If applicants include damage and weathering on their costume, a clear effort to make the level of damage and weathering consistent across all parts of the costume must be apparent. Damage and weathering must appear to have been applied in a realistic manner. Helmet must feature a blast shield or Pilot’s brow/ mohawk ridge. Visor must be dark enough to obscure the wearer’s face. Ear caps are required, but a rangefinder is optional. One or two hoses must run from the helmet to life support box worn on the chest or back. MUST be fitted and spaced correctly depending on armor/body type. Good rule of thumb, maximum spacing should equal no more than 1 inch between collar/chest/gut plates. No more than 1/2 inch between diamond and chest plates. Must be of adequate size in proportion to your chest area. Chest plates should not exceed 1 inch beyond edge of collar maximum. Rivets used for attaching armor must be painted to match armor. 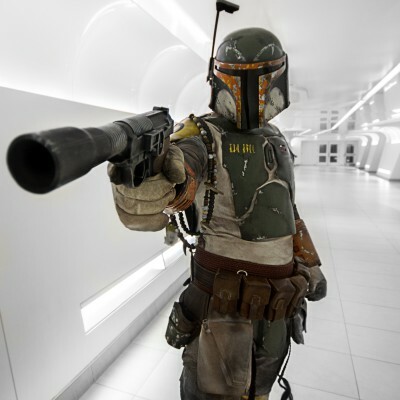 Armor plates used for custom costumes may not include the same dents that appear on Boba Fett costumes. Armor worn on the front of the torso must include a collar plate, chest plates, a chest diamond, and an ab plate. If a Boba or Jango Fett ab plate is being used, the height of the plate must be approximately 1/2 the measurement of the width. A chest diamond is not required if the applicant is wearing Boba Fett Holiday Special style chest plates. It is required in all other cases. 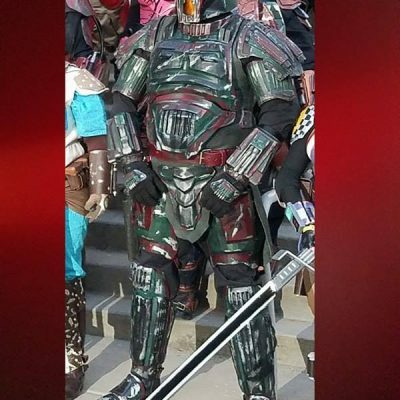 Sabine-style chest armor is not approved for custom costume applicants without modifications. Applicants must add collar armor that covers the upper chest area between the shoulders horizontally and between the throat and the top of the chest armor vertically. An ab plate must also be added. 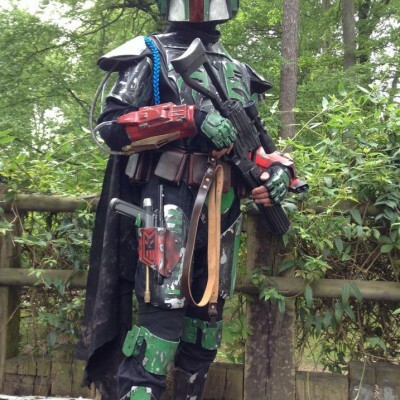 Unmodified Rebels Imperial Commando chest armor is not approved for custom costume applicants. Clan Wren Female and Male armor styles are approved for custom applicants. 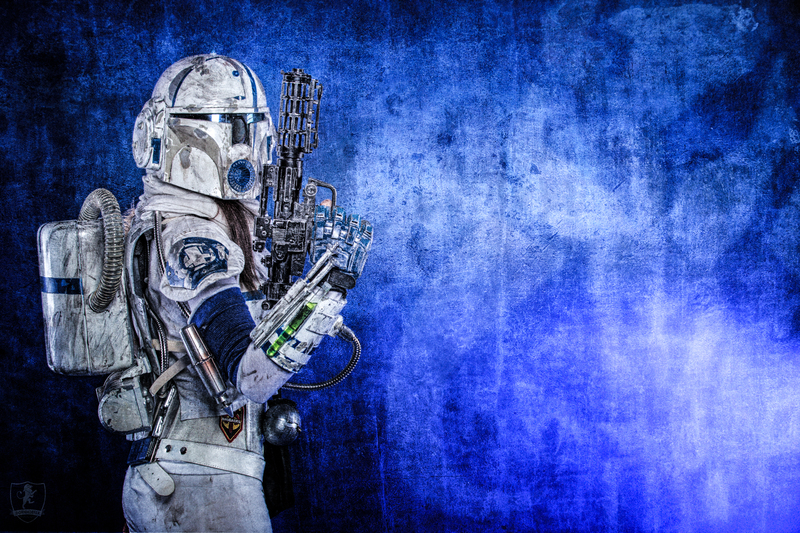 Costumes using these armor styles must adhere to the custom CRLs in all respects. Legacy chest armor must not have any gaps between collar, chest armor, chest diamond, and ab armor. Consists of collar armor, right and left chest plates, ab plate, and optional center diamond. All armor must attach securely to the vest with proper spacing. Life support box must rest securely on the front torso armor or be mounted to the backplate. Life support box may be attached directly to the armor or it may have its own harness system. Life support box harness system must be made from leather, vinyl, or nylon. Life support box must feature a system of switches and knobs and buttons that appear well integrated into the prop and not simply glued on. Life support box must have two locations for hoses to be affixed. There must be a flange on the box where the hose and the box meet. Knees and Cod are the minimum of lower armor required. Soft cod or Loincloth is acceptable, As well as Shin/Knee combo plates (Shnees) being an acceptable variant for knees. Pairs of armor like thighs, knees, shins, and boot are considered ONE piece as a set. Cod piece or loin cloth is required. Either may be counted as ONE piece of armor below the waist. 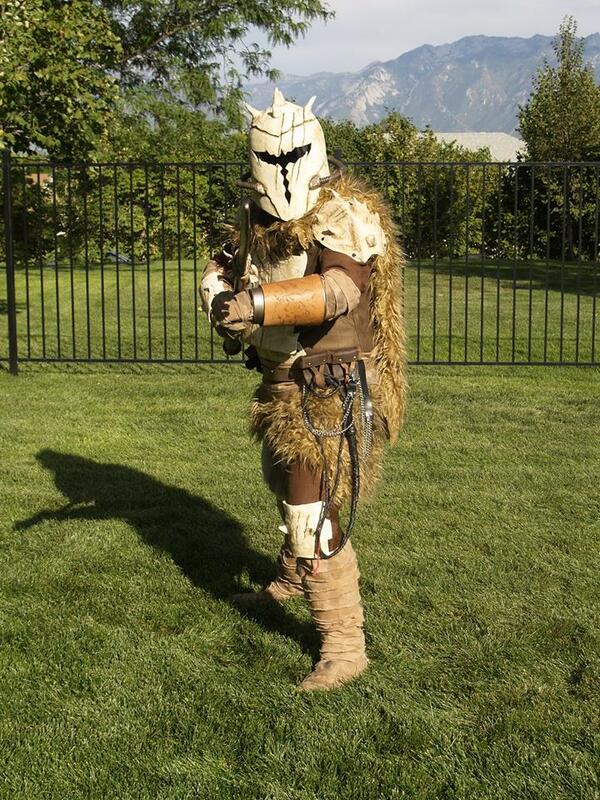 Soft cod armor may also be used as well as hard cod armor and loin cloths. However soft cod armor must look “in universe” and be of high quality. Examples would include Darth Vader and Biker Scout style soft armor. The top edge of the cod plate must be fully covered by an accepted waist item. Knee armor at-minimum is required. Cod/loin cloth not required but approvable. Plates should be sized correctly so that they are proportionate to your body size. Must cover at least 2/3 the overall width and length of the back. 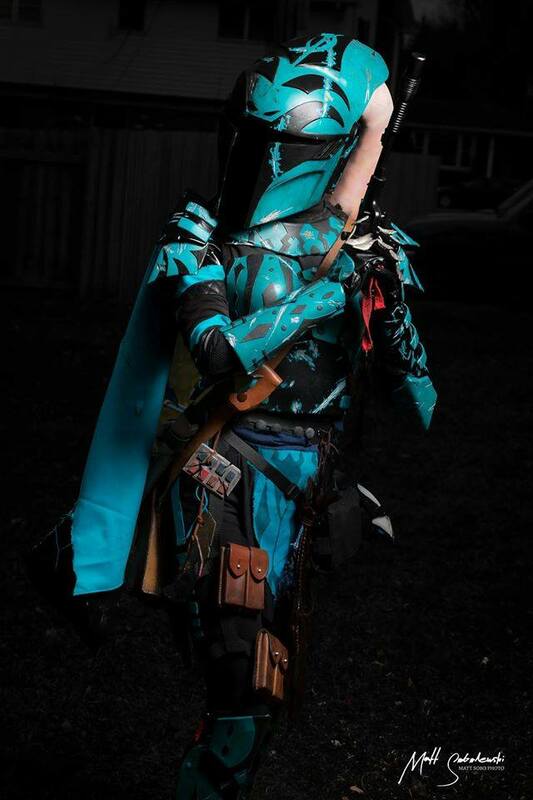 Back armor SHOULD be used as all canon references for Modern Era Mandalorians show back armor. 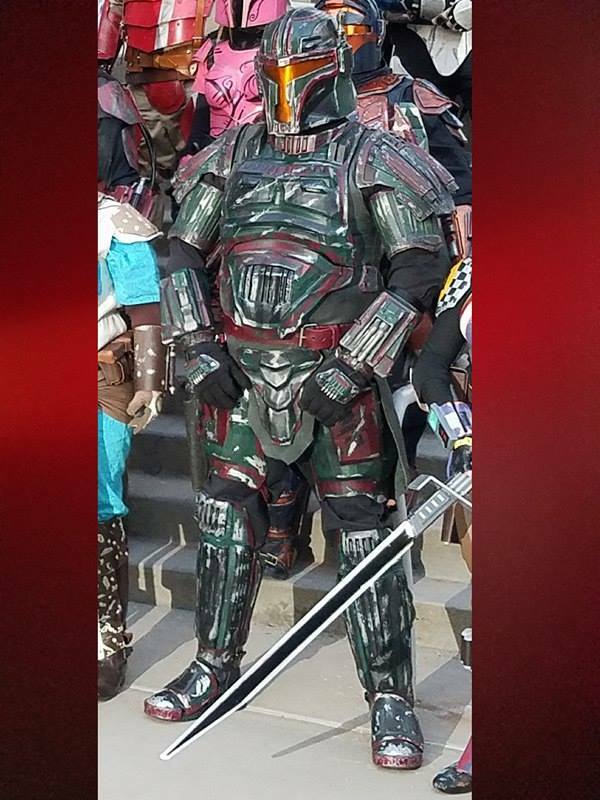 However, if your Mandalorian wears a duster or other jacket or a cape that fully covers the back from shoulder to shoulder and neck to waist, the use of a backplate is not required. Backpacks and jetpacks are also acceptable in lieu of a back plate. However, the back covering must completely cover the back as to make it unknown that there is no backplate present. Soft back coverings can be substituted for back armor pieces as long as they add to the overall look of the applicant’s armor. Soft/hard backpacks/packs are acceptable alternatives. Capes of all styles will be judged on a case-by-case basis based factors including, but not limited to, fabric type, weathering, and quality. Edges of the Legacy armor sections must meet or overlap. A wraparound collar or backplate that extends to the wearer’s shoulder blades is required. If the life support box is worn on the back, a full backplate must be worn. 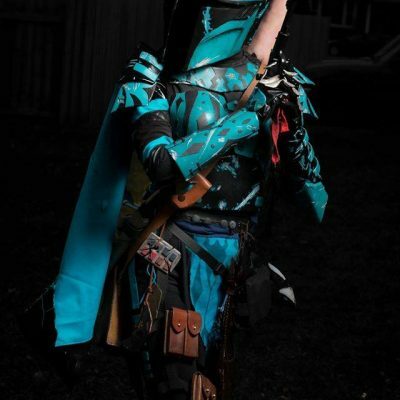 Are not required to be Fett style. Must sit above the bicep muscle and cover the deltoid area. The top edge of the plate can either be lined up with the shoulder seam or sit slightly above it. If unsure, please contact an Applicant Team member for clarification. Leather and nylon strapping may be exposed. Elastic strapping must be concealed EXCEPT on knees, elbows, and “Boba Thongs” where they must be color matched to flight suit. 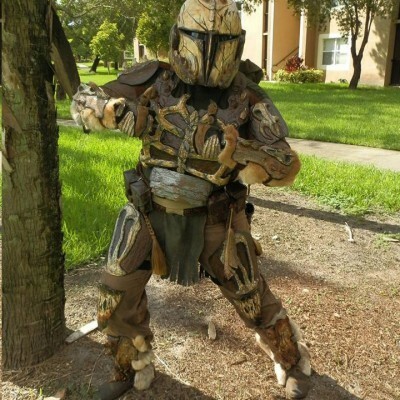 Unmodified armor pieces from any modern Mandalorian armor template including Boba, Jango, Legacy, TCW, and Rebels are not permitted to be used in place of other armor pieces. For example, unmodified shoulder armor cannot be used in the place of knees. The shoulder armor can look similar to the knee armor in this case, but they cannot be the exact same template. Some form of armor or rigid covering on the lower arms (Gauntlets, hard bracers, or gloves). Sports armor used must be highly modified to no longer look like sports armor. Forearm coverings, with the exception of fabric wraps, are designed to give the appearance of heavy armory for protection and/or striking weapon and/or weapons platforms. 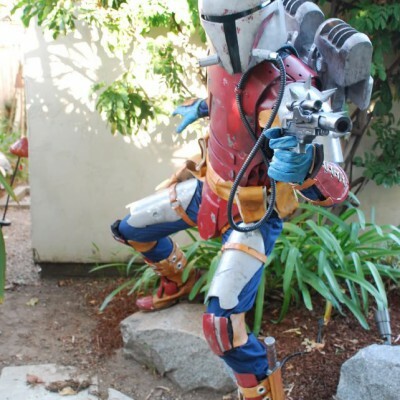 Unmodified armor pieces from the Boba, Jango, and Legacy templates are not permitted to be used in place of gauntlets. For example, Jango shin armor cannot be used as gauntlets. Full or half/bracer style hard shell gauntlets that cover 2/3 of the length of the forearm from wrist to elbow. Materials such as vinyl, pleather, and thin leather or suede will NOT be acceptable as a use for forearm covering. They can be used as a method of mounting half bracers but are not permissible alone. Ren Fair/Larp/Reenactment bracers and unmodified-Leather bracers are no longer acceptable. 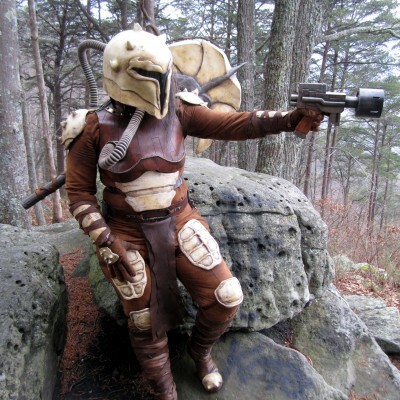 Wraps will no longer be permitted to replace gauntlets unless used specifically for the “Montross” Mandalorian character, future canon characters with wraps for gauntlets, or Early Crusader armor kits. Mounted weapon systems must appear to be mounted to a piece of armor in a practical and functional way. Weapon systems that appear to be ‘just glued on’ will not be accepted. For example, Boba and Jango’s rockets are mounted onto a raised firing platform. T-shirt vests are NOT acceptable as armor vests. MOLLE/TAC and paintball style vests may still be used without any modification. However, the armor must be of a canon or custom style that COMPLETELY covers the vest. 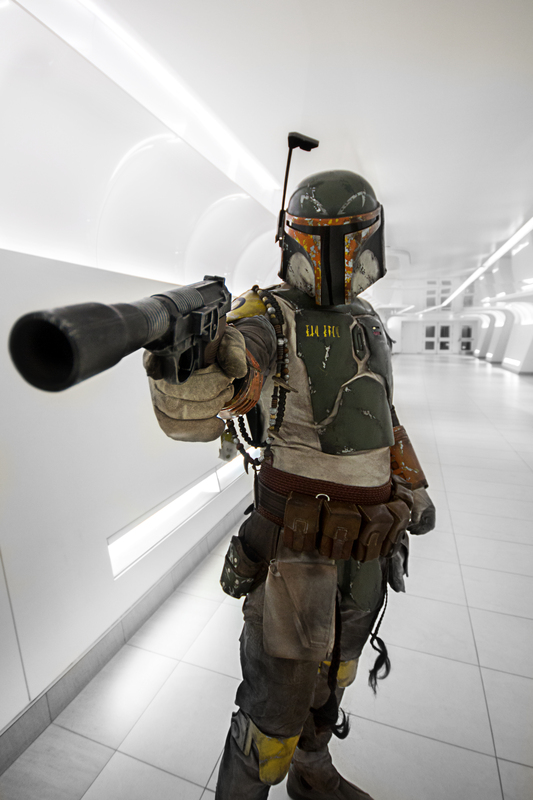 Vests may be traditional Boba/Jango style or custom style. If you have a question about your vest, ask a council member. Ensure vest is properly fitted/tailored for you. Baggy and over-sized vests are not acceptable. Zippers must be completely hidden from sight. The vest must be comprised of solid color block(s). No printed fabric may be used as part of a vest. The vest must not be longer than the chosen waist items. Vest fabric must be thick enough to support armor plates without sagging, creasing, or wrinkling. Suggested materials include duck cloth, leather/imitation leather, or quilted fabric. A neckseal is required and should be the same color as the vest. Flight suit must fit snugly to the wearer. One or two piece flight suit designs are acceptable. If using two separate pieces, they must give the illusion of a one piece flight suit by using the same color and material for each piece. (We should not be able to tell the difference). With double sleeved flight suits, contrast of color is acceptable on the arms if the shorter sleeve matches the color of the flight suit. Zipper pull tabs must be hidden from view. External pockets on the seat of the pants must be removed. Internal slit pockets on the hips and slit pockets on the seat of the pants must be hidden, sewn shut, or fully closed so that they don’t fall open. The flight suit must be a solid color. No printed fabric may be used as part of a flight suit. Flight suit sleeves must not protrude from the ends of the gauntlets. Full length sleeves are required. The flightsuit must feature pouch style pockets with a flap closure on the front of the thigh. Loin cloths are an acceptable replacement for cod armor, or can be used in conjunction with cod armor and/or kama. Loin cloths should be worn UNDER the belt or waist sash. Loin cloths must be more substantive than a single piece of rectangular fabric hanging from the belt, and must be constructed of quality material (heavy fabric, leather, or vinyl) in a design that compliments overall costume quality. Shemaghs will fall under the quality clause and if the App team deems it takes away from the quality of the kit than the shemagh will be requested to be removed from the kit. You must have at least two of the following items in any combination: ammo belt, girth belt or waist sash, holster belt. No cell phone pouches on ammo belts for adult submissions. A Girth Belt/Waist Sash MAY be a required addition depending on the need for coverage in the waist/girth area. At least one belt is required. Belt must attach to the ejection harness. The ejection harness must be made of nylon/nylon webbing. Harness consists of a vertical strap(s) that extends from the belt to the area just below the knee. If there is only one vertical strap, it must be worn between the legs. If there are two vertical straps, one must be worn out the outside of each leg. Vertical strap(s) must connect to a loop that wraps around each leg individually just below the knee. External strapping must be of an in universe material, examples include but are not limited to tactical web belting and leather. Elastic strapping is generally unacceptable for external use (refer to the following exceptions). The preferred method for the use of elastic strapping is to conceal it within the flightsuit. Elastic may be used for boot armor strapping, but must be of the high quality elastic and same color as the boot. If fully hidden from view by armor accessories such as kama’s, ammo pouches, capes, holsters etc. It would be recommended to use a higher quality elastic rather than the inexpensive “sew in” type, in the event the coverage moves and it’s exposed. It would also be best that it match the flightsuit in color or be colors that compliment the overall color palate of the costume. Full fingered or fingerless gloves are acceptable. Labels and brand names must be removed or covered. Gloves must fully cover the front and back of the palm and wrist. Combat/Utility boots are considered the primary accepted boot for armor. Labels and brand names should be removed or covered. Shoe-laces MUST be covered with armor or some sort of boot/ankle spat. 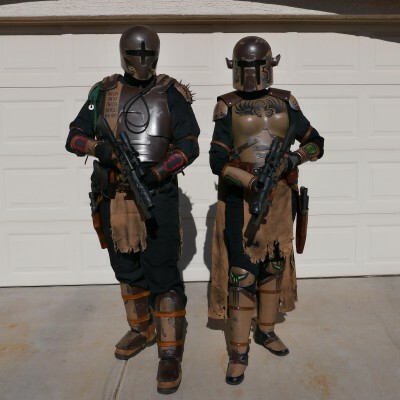 High heels/stiletto female boots are not acceptable mandalorian armor attire. Platform, wedge, and chunky style heels are acceptable. Laces on gaiters and half-chaps are acceptable as long as they do not appear on the top of the garment where boot laces would normally appear. These styles of gaiters and half-chaps are not recommended as there are other styles without laces readily available. Exposed zipper closures on boots are acceptable as long as they are located on the inside of the foot and match the color of the boot. Zippers that do not meet the above requirement must be completely hidden from view by armor plates, spats, wraps or an extension flap. At least one weapon of Star Wars-universe style (not Earthly-looking). Nerf and other similar toy weapons MUST have labels/logos removed and repainted. Manufacturer screw holes MUST be filled and smoothed. They must also be modified so they no longer appear “straight out of the box”. Meaning parts swapping, kit bashing, and the use of greeblies is required. Think “70’s future tech”. Applicants must now provide 1 picture of their full weapon load-out when applying. Upload will be available on the application. Small sidearm is required. No bulky, lengthy, or heavy weapons. Survival knife allowed, but not required. Jetpacks are not approvable for pilots. ‘Naked’ circuit boards glued on to items as greeblies are no longer acceptable. If circuit boards are used as greeblies, they must be modified so that they fit the 70s tech aesthetic of the films. Any use of exposed circuit boards as greeblies will be highly scrutinized. Greeblies made out of common items such as electronics components must be modified or used in such a way that they are not immediately recognizable. These components are still very much available for greeblie use as always, but creativity with modification and/or placement is suggested. We highly encourage the use of uncommon or obscure items as greeblies. Lightsaber/darksaber hilts may be worn as trophies, but must be visibly damaged as to appear unusable. Such trophies must be worn or mounted in such a way as to not appear to be a functioning weapon. No full bladed lightsabers/darksabers may be carried unless your character is portraying an *in-canon* lightsaber/darksaber wielding mando (i.e., Bardan Jusik, Kad Skirata, Pre Viszla). 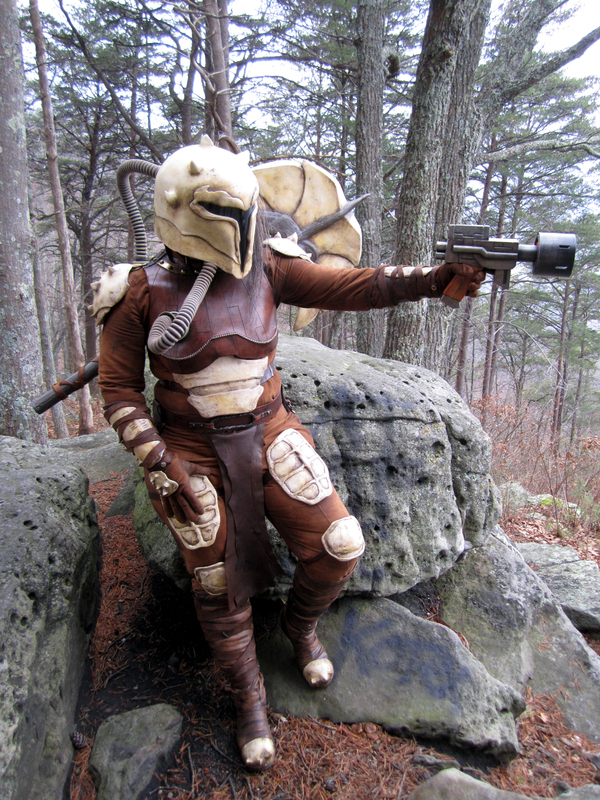 These items/concepts should NOT be used in your custom Mandalorian costume character. Absolutely no spring loaded weapons or devices will be allowed. All such devices, including foam dart launchers of any kind, must operate manually. Otherwise they must be rendered inoperable. No visible zippers or closures on flight suit or armor/flak vest. No jeans, t-shirts, sweat suits, etc. used as flight suits or armor/flak vests. No Jedi-Mandos or Sith-Mandos. “Force-adept” or “Force-sensitive” Mandos are acceptable. No gruesome themes or items/elements including, but not limited to, human or human-like bones, skin, or organs. This policy is not limited to trophies and includes sculpted or otherwise attached elements. EVA foam is not an acceptable armor building material for the MMCC. EVA foam MAY be considered for use on parts such as “soft cods” and “soft” knees. It will be a suitable material to back plating on knees and such for comfort. Any EVA that is visible, ie. soft cods and soft knees, will be HIGHLY scrutinized. It is HIGHLY recommended that if you choose this route, you heavily incorporate the App Team in the WIP and apply any suggestions to increase the probability of acceptance. No “modern” or “common” off the shelf camo patterns may be used. Camo patterns allowed must be uncommon, vintage, or in-universe and will be highly scrutinized during the application process. Officially barred “off the shelf” camo patterns: Woodland, Tiger Stripe, 3 Color Desert, MARPAT, Real Tree, Mossy Oak, ACU, Urban, 6 Color Desert, Swiss Alpineflague, and MultiCam. No unmodified parts or themes can be used from Star Wars canon/legends face characters. This includes, but is not limited to, lightsaber trophies, lightsabers/darksabers, paint schemes, and armor pieces/elements. This does not include blasters, knives, and other non-unique weapons or small props. Parts and themes from non face characters such as storm troopers and clone troopers may still be used as long as they adhere to the CRLs in every other manner. 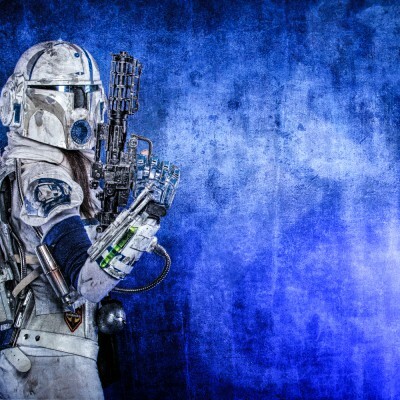 Schubiwon/Shubiwan armour is banned for use in the MMCC. This is solely to protect our members from what has been deemed within the costuming community as overpriced and subpar armour. 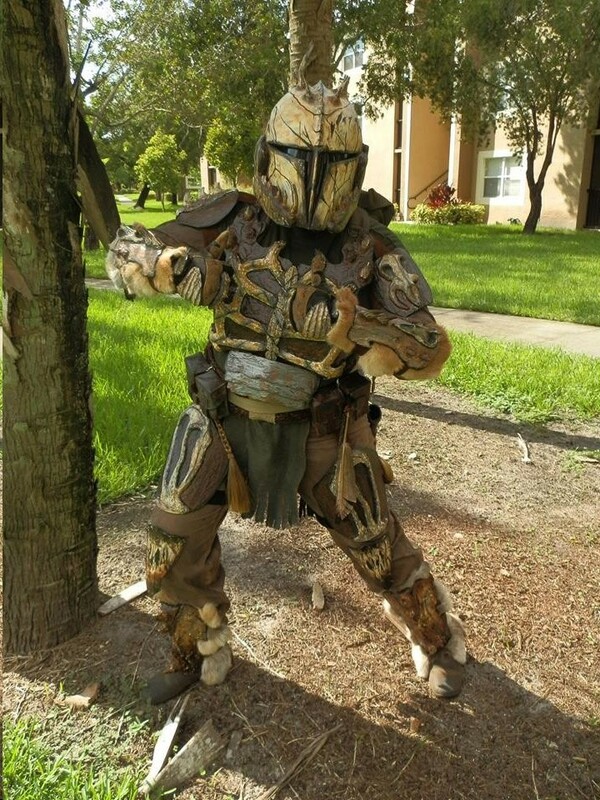 The Mandalorian Mercs Mandalore and/or Command Council reserves the right to change these standards as they see fit. With each change, an announcement will be made via the MMCC forums. 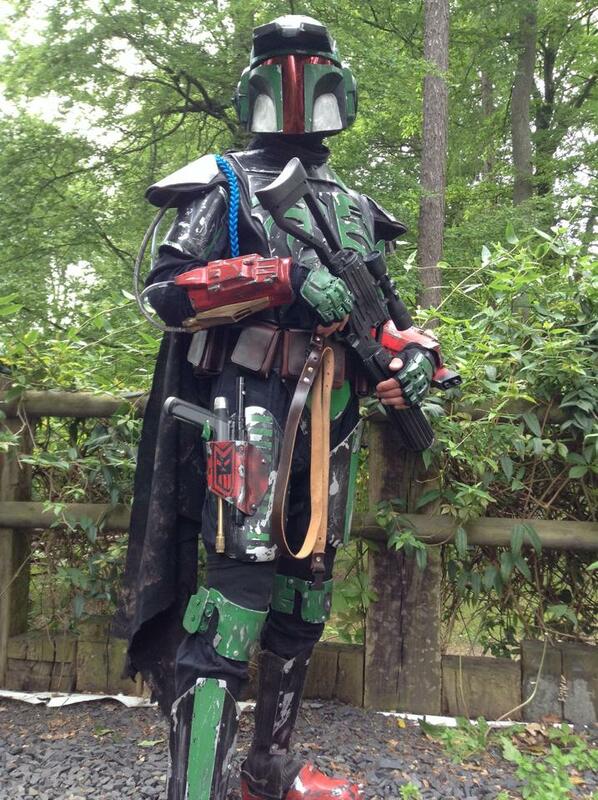 Members of the Applications team are volunteering their personal time to the Mandalorian Mercs. As volunteer members they have the right to perform their role for the club free of threatening behaviour, harassment and bullying from applicants. IF ANY APPLICANT IS ABUSIVE TOWARDS THE APPLICATIONS TEAM IN ANY WAY, YOUR APPLICATION WILL NO LONGER BE TENDERED. Please only contact the Apps Team through Official channels. Helmet or mask with full head cover. Visor of “T” or “Y” style that cannot be seen through from front. Must LOOK like a Mandalorian helmet from Early/Sith wars Era or designed similarly. Breathing hoses/tubes are a REQUIRED element in this era. Use of clone helmets or modern era Mando helmets are NOT acceptable. Modern Era armor is NOT acceptable for this era. MUST be fitted and spaced correctly depending on armor/body type. Chest plate is required. Note that most chest armor of this era is one piece and made of leather or leather-like materials. Hard chest plates are also acceptable. Cod piece or loin cloth is required. Armor should have an organic feel to it. It should appear to be bone, leather and/or rough pounded metal. The use of teeth, spikes and/or bones in armor and adornments are highly recommended. Rivets used to attach armor must be painted to match armor. Jetpacks are NOT acceptable in this era. Some form of shoulder armor. Note that most shoulder armor of this era is large and covers the entire shoulder as to protect the shoulder joint. Some form of knee covering is required. A Shin/Knee combo plate (Shnees) is an acceptable variant for knees. Some form of armor or rigid covering on the lower arms (Gauntlets, hard bracers, and quality handwraps). Fabric wraps from the wrist to at least 3/4 up the forearm. Wraps must be of high quality. Acceptable styles of fabric wraps are those worn by, but not limited to Tusken Raiders, Kaleesh, and Quinlan Vos. Full or half/bracer style hard shell gauntlets. Heavy leather bracers which wrap at least 3/4 of the way around the forearm. Laces are HIGHLY discouraged as a method to secure these types of bracers. Preferred methods would be belting or buckles. Materials such as vinyl, pleather, and thin leather or suede will NOT be acceptable as a use for forearm covering. Pleathers or vinyl COULD be made into strips for wraps but are unacceptable as bracers. Modern era gauntlets are NOT acceptable. NOT a required element in this era. 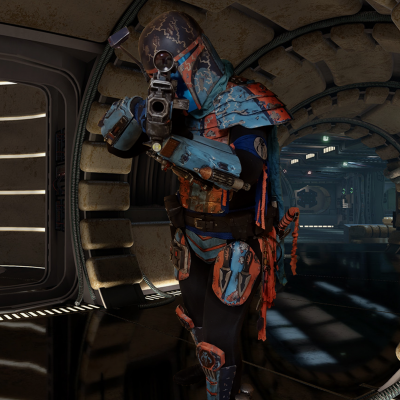 Armor can be attached directly to the flight suit or strapped onto body. T-shirt vests are not acceptable as armor/flak vests. If you choose to use a vest, ensure the vest is properly fitted/tailored for you. Baggy and over-sized vests are not acceptable. Some form of neck seal is required to meet the fully “sealed” flight suit requirement. Neck seals can be separate pieces or built into the flight suit. You must have a properly fitted/tailored flight suit. A fully “sealed” flight suit is required for this era. Meaning, no visible skin showing. Fingerless gloves and sleeveless or bare arms are NOT acceptable. Leather or leather-like materials are highly recommended. You must have either an ammo/girth/holster belt or waist sash, or any combination of these four items. 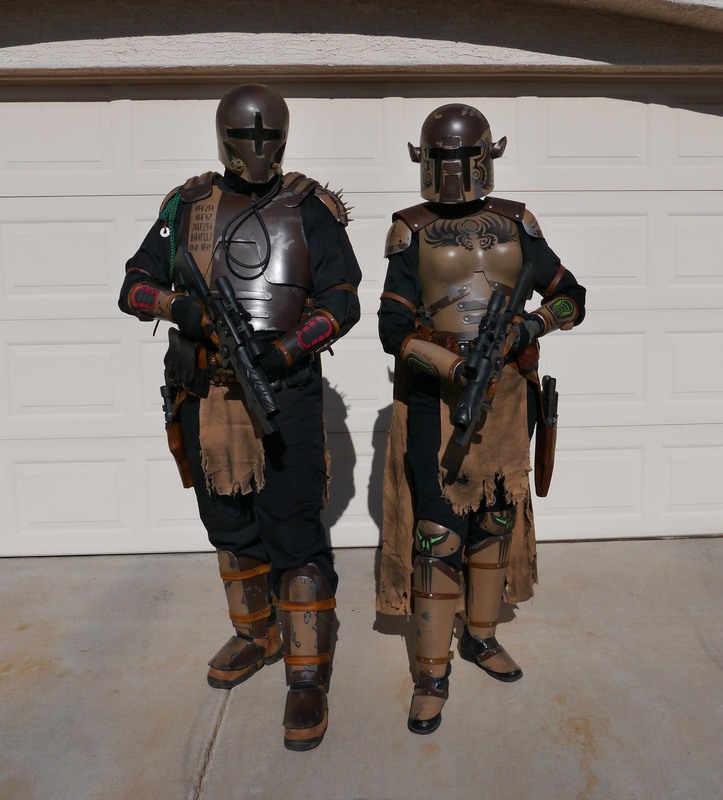 Pouches should be kept to a minimum and not of the type used on modern era Mandalorians. Leather, leather-like, or cloth are the only materials acceptable for belts, straps, and pouches in this era. Nylon straps, belts, or pouches are NOT acceptable. Visible plastic clips/belt closures are NOT acceptable. Full fingered gloves are required to meet the fully “sealed” flight suit requirement. Shoe-laces should be covered with armor or some sort of boot/ankle spat. 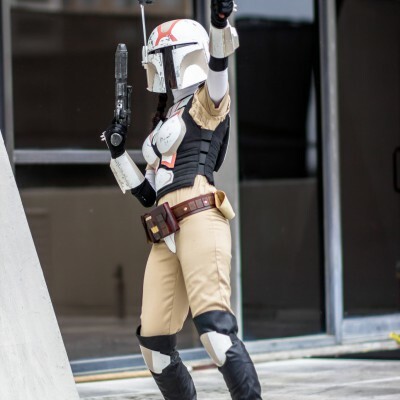 High heels/stiletto female boots are not acceptable Mandalorian armor attire. Platform, wedge, and “chunky” heels are acceptable. At least one weapon of Early/Sith Wars style. Ancient melee weapons and ancient style blasters are preferred. Modern era weapons are NOT acceptable. Mounted weapons must appear to be mounted to a piece of armor in a practical and functional way. Weapon systems that appear to be ‘just glued on’ will not be accepted. For example, Boba and Jango’s rockets are mounted onto a raised firing platform. Lightsaber/darksaber hilts may be worn as trophies or tools. No modern era helmets, gauntlets, chest or body armor. No visible nylon or elastic strapping. No blood, gore, or human skulls. ALL visible sports armor up to and including soccer shin guards and any combination sport or SWAT/Military/Occupational foot/shin/knee pads will not be accepted by any new applicants who wish to apply for Official Membership within the MMCC, unless used as plate carriers and are modified beyond the normal earthy appearance of the stock piece. Full helmet with visor of “T”, “TT”, or “+” style that cannot be seen through from front. Must LOOK like a Mandalorian helmet from late/crusader era or designed similarly. Please try to either exactly duplicate, or heavily base your helmet design after those in the reference pics. Ultimate is the only exception. Modern-era chest armor is NOT acceptable for this era. Use of leather straps are recommended for this era. Use of reference pics provided is highly recommended. There are many different designs for the crusader era armor. Basing your designs off an already published design is your best option. Groin must have hard or padded armor covering (can be replaced with loin cloth). Use of lower body armor is highly recommended, but not required. Jetpacks are acceptable in this era. 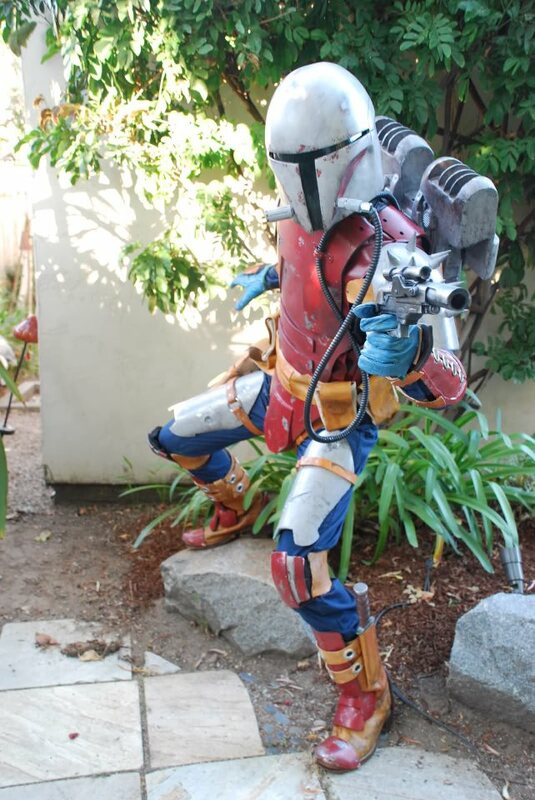 Modern era “Boba/Jango style” jetpacks are NOT acceptable. Note: When using a cape without a backplate, the lack of backplate should not be noticeable. Use of shoulder armor is required. Many designs are acceptable. Laces are HIGHLY discouraged as a method to secure these types of bracers. Preferred methods would be belting or buckles. NOT a required element in this era. 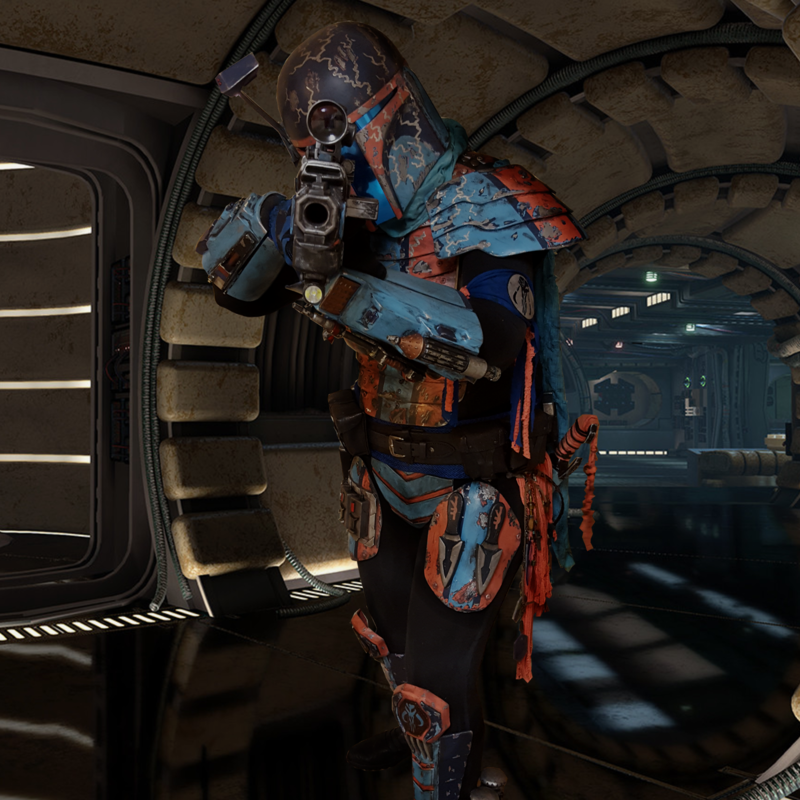 Armor can be attached directly to flight suit or strapped onto body. Ensure vest is properly fitted/tailored for you. Baggy and over-sized vests are not acceptable. You must have a properly fitted/tailored flight suit or comparable under-armor clothing. A fully “sealed” flight suit is required for this era. Fingerless gloves and sleeveless or bare arms are NOT acceptable. Some form of neck seal is required to meet the full “sealed” flight suit requirement. Leather, leather-like, and cloth tie materials, pouches, ammo holsters, weapon holsters, bandoliers are acceptable. At least one weapon of late/crusader style (not modern-looking). Ancient melee weapons and ancient style blasters are acceptable. Mounted weapon systems must appear to be mounted to a piece of armor in a practical and functional way. Weapon systems that appear to be ‘just glued on’ will not be accepted. For example, Boba and Jango’s rockets are mounted onto a raised firing platform. These items are not required, but are included as additional suggested costume components. Use of Mando’a lettering and phrases on armor. Leather straps or pouches, bandoliers or ammo belts. Use of Crusader sigil in armor design. Full helmet of Neo-Crusader style is required. Helmet should have a hard face plate and a hard helmet, the helmet should be covered by a same color cowl extending to the neck with the face plate exposed. The cowl should be of a soft material that allows for flexing and turning of the head. Please try to either exactly duplicate, or heavily base your helmet design after those in the reference pics. Helmets may be adorned with items such as macrobinoculars, lights, antennae, and visors. Masks are NOT acceptable for this era. Hard shell/cowl helmets, such as repainted Royal Guard helmets, will NOT be acceptable for Neo Crusader usage. Must be painted either red, blue, or metallic/non-metallic gold with white detailing to match references. All armored pieces must be painted the same color. Single piece chest armor required. Groin must have hard or padded armor covering. Use of thigh armor is highly recommended, but not required. Use of shin armor is required. 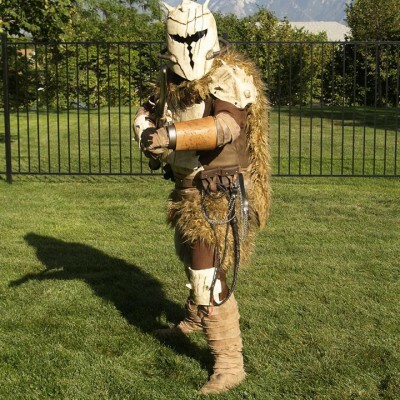 Full enclosure leg armor is recommended, but not required. Boot armor is recommended, but not required. Single piece back armor is required. (Backpack, back armor, air tank, etc.) Must cover at least 2/3 the overall width and length of the back. Gauntlets with weapons are recommended for this era. Hand armor is recommended, but not required. Form fitting flight suits should be used for this era, they should have the sturdiness of a normal flight suit, but should hug the body. Flight suits should be black, grey or match armor color. Half capes can be worn in addition to the required back-plate. Kamas are acceptable and should be worn UNDER the belt or waist sash. Loincloths can be worn in addition to the required groin covering and should be worn UNDER the belt or waist sash. Soft cods can either be built into the flight suit or worn separately. Leather, leather-like, or cloth are the only materials acceptable for belts, straps, and pouches in this era. Nylon straps, belts, or pouches are NOT acceptable. 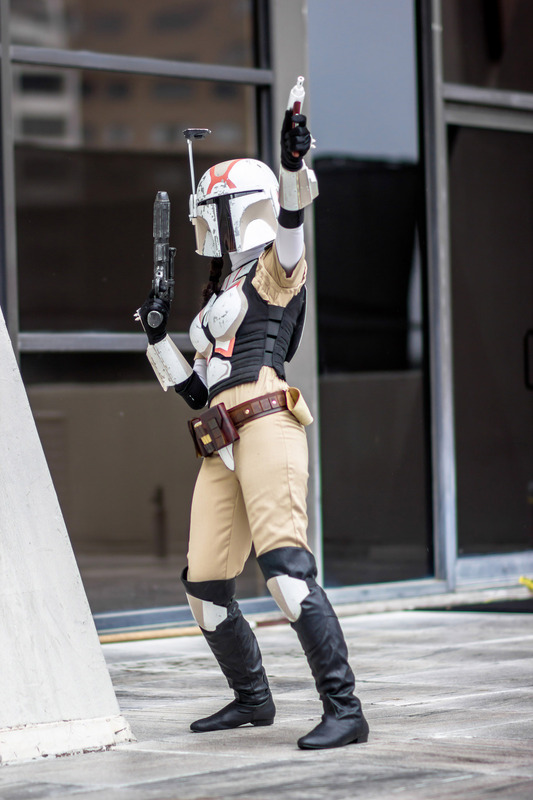 High heels/stiletto female boots are not acceptable mandalorian armor attire. Platform boots are acceptable. At least one weapon of neo-crusader style (not modern-looking). Late/crusader era weapons are acceptable. Capes, kamas, and loincloths encouraged. Use of Neo-Crusader sigil in armor design. SWAT/Military/Occupational foot/shin/knee pads will not be accepted by any new applicants who wish to apply for Official Membership within the MMCC, unless used as plate carriers and are modified beyond the normal earthy appearance of the stock piece.